There’s always something to learn in the world of real estate investing and lending. Though we’ve been making Hard Money and Private Loans throughout Southern California for over 10 years, we never miss an opportunity to educate ourselves. Staying current by reading industry publications, attending seminars and listening to our highly experienced and knowledgeable broker partners, real estate investors and trust deed investors are just a few of the ways we stay ahead of the curve and on top of our game We feel that ongoing and continuous learning is one of the great joys of life and keys to success. 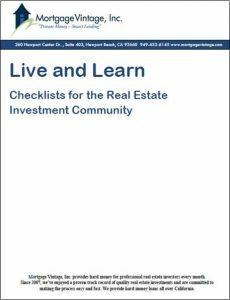 Take a look inside our “Live & Learn” checklist for the real estate community we think you’ll find a few new strategies to propel your learning and increase your expertise in our incredible Industry.